He was born in the historic city of Leicester and began studying from his mother at a young age, a student of Habib Umar b. Sumayt, Syed Ahmed Abdullah Saleh Faris, Syed Abu Bakr al-Shibli and other notable scholars from Zanzibar, East Africa. At the age of 9 he began studying classical Islamic studies under Shaykh Muhammad Adam b. Eesa al-Qadiri and Shaykh Abu al-Qalam Qadri, where he studied texts of Arabic grammar, Aqeeda, Hanafi Fiqh, Qur’anic exegesis and accomplished the mammoth task of memorising the Holy Qur’an. He then went on to study privately in Zanzibar, East Africa under his grandmother and uncle as well as other scholars whom he studied various traditional Arabic texts. He is currently a Director of Islamic Sciences at Jamiya Sufiya – Spiritual Foundation Leicester. Additionally, Imam Khalid is involved in work with the local and wider community as a visiting lecturer and is an active member of both the Interfaith Committee. His recent work has included chairing national conferences, publishing magazine articles, translating classical Islamic texts and several television appearances. 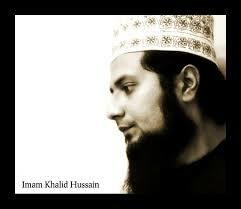 Imam Khalid is blessed with being able to speak six languages. He is someone who is deeply committed to the service of the Muslim Ummah and is acutely in touch with the issues facing Muslims in the United Kingdom.